Müller has eight goals and 13 assists to his name in all competitions this season. Bayern Munich forward Thomas Müller is confident the record German champions can overturn their 2-1 first-leg deficit to Real Madrid when they meet again in the Champions League on Tuesday. 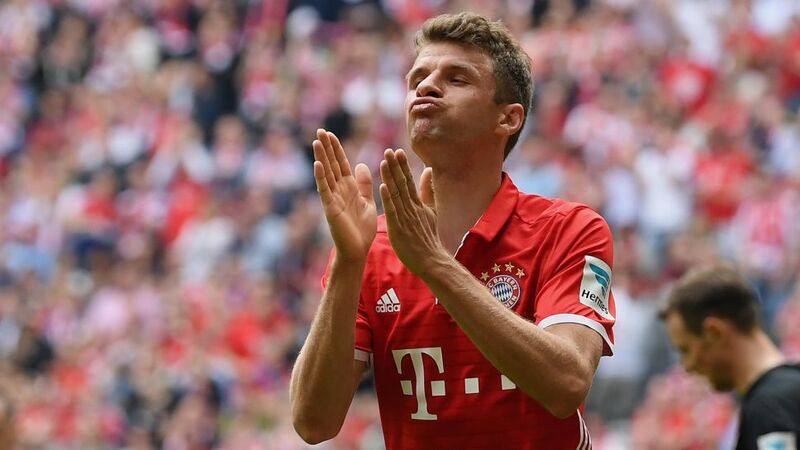 Question: Thomas Müller, what emotion do you take with you to Madrid on Tuesday? Do you go there with defiance? Thomas Müller: No, not defiance. We go to Madrid well aware of the fact that nothing is impossible. We’re annoyed any time we don’t win, but we have our own way of playing. No matter what problems or injuries we have to deal with, we’re always able to put a strong team out there on the pitch. Müller: We know how difficult this game can be, but we also know what our chances are. In theory we only need the same result as what we had after the first half in the first leg [Bayern led 1-0 through Arturo Vidal’s header before Ronaldo's brace]. If we beat them 2-1 and then penalties… then we would almost be through. Things can happen so quickly in football. We don’t need a miracle like Barcelona had in their return match against Paris. We will not be inhibited against them. Question: What is the key winning the match away to Madrid? Müller: We know we're behind. But it’s not impossible. We need two goals and have 90 minutes for that. If we can do that alone then we can force extra time.